The A-Kruunu wooden apartment building project is located in Kuninkaantammi, Helsinki, which is a new and developing area. The area is located in North Helsinki next to the Central Park, with good public transport connections. Construction of Kuninkaantammi began in 2013, and the area is developing rapidly. The entire area is expected to be finished by 2025 with 5500 residents and 1000 people employed in the area. Kuninkaantammi will be a green urban area. The plot for the project was acquired through a City of Helsinki programme aimed at developing apartment buildings. The City of Helsinki signed over the plots to the project comparing wood and concrete as building material. The project constructs and compares otherwise identical apartment buildings constructed of wood and concrete. The projects will be compared during planning, construction and residence. The aim of the programme is to diversify production of apartment buildings and to improve the quality, appeal and unique new solutions for urban living though cooperation. The project has been implemented with a design–build contractor so that both projects (wood and concrete) will be using corresponding solutions regarding basic aspects and more detailed implementation (e.g. HPAC systems). This is to ensure the comparability of the in-use data of the comparative study. In addition to consistent implementation and system solutions, having the design-build contractor participate in the project has enabled financial monitoring and steering during project development. The contract type has provided the most appropriate solutions for the customer during the span of construction, without extra investment costs. Rents of the apartments are determined by actual costs, and the realised rents of the project are about 70% of the market level in the area. During the lifecycle of the building, rents are expected to remain reasonable and to have a lesser response to e.g. energy price fluctuations compared to normal rental buildings. This is due to the fact that the building’s energy consumption is over 20% under the National Building Code of Finland levels, and even some of the electricity of the building will be generated independently using solar panels installed on the roof. 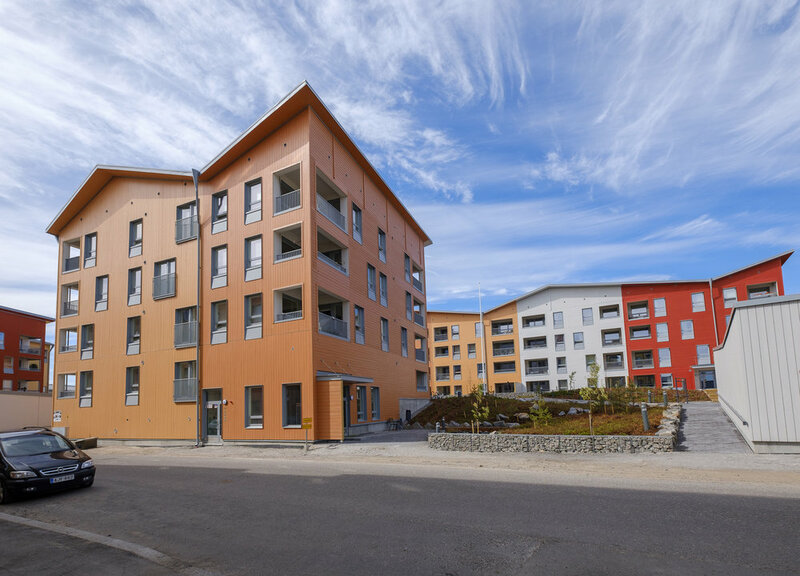 The project has been funded with a 40-year soft loan and additional starting funding of 10,000 €/apartment granted by the Housing Finance and Development Centre of Finland (ARA). Over 2800 tenants applied for the 58 apartments available. An unheated parking space area for the apartments has been reserved under the courtyard deck. One of the most significant points of comparison in the project comparing wood and concrete was carbon footprint (without a carbon sink). The comparison of the carbon footprints of the two projects constructed in neighbouring plots will cover construction as well as a monitoring period of two years of use, assessing the lifecycle emissions of the project. Monitoring will provide practical data on aspects such as whether the mass of the frame has an effect on the actual energy consumption of a building. Both calculations are carried out by VTT Technical Research Centre of Finland. Monitoring during use will also include the humidity monitoring of structures. After construction is finished, data will be gathered from the projects using sensors installed in the frame structures. For the first time, in Finland at least, the comparison of construction materials can be carried out without external factors affecting the comparison (adjacent plots, otherwise similar buildings, same designers and constructor). The measured results of the humidity monitoring can be used for various purposes, such as the development and design of future projects. In the comparison study, the carbon footprint during the construction period of the concrete building was 41% greater than in A-Kruunu’s wooden building. - The in-use energy consumption of the A-Kruunu building is lower than the average Finnish project since the project is more than 20% under the requirement level for new construction and since some of the building's electricity will be generated within the building using renewable solar energy. The implementation of the project has observed environmental factors by, for example, delaying storm water on the property and the design of separate rain gardens and green roofs. Generous, locked storage space has been reserved for residents’ bicycles. A significant regional public transport cross connection passes through the area. As a part of the comparative study, the residents’ satisfaction with the housing of the wood and concrete projects will be researched during the two first years of residency. The research will provide comparative results since the projects being compared are in the same area, implemented and constructed by the same designer and constructor and are even using the same technical solutions for the real estate. These results can be utilised for future project development. The apartments in the buildings vary between small 34.5 m2 studios and larger 88 m2 apartments suitable for families of 4; this way, different residential needs can be accommodated. Different facilities aimed to generate a sense of community have been implemented, such as residents’ club room and shared sauna. 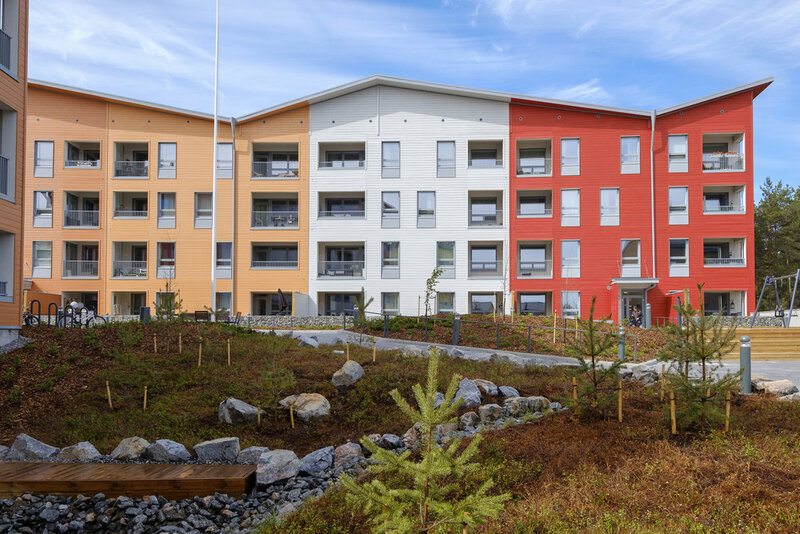 The types of ownership and funding for the projects in the Kuninkaantammi area have been predefined to prevent segregation, and the concrete building project – the comparison project of the A-Kruunu project – consists of partially owned apartments whose residents have versatile socio-economic backgrounds. Still, residents of both projects will share some facilities, such as the yard areas and the parking space area. The residents for the building are chosen using ARA’s resident selection guide where applicants are compared based on the need for housing and the level of wealth and income, and the apartments are reserved for the people most in need. Priority is given to people with no current residence, people with the most urgent need for residence, and people with the lowest level of wealth and income. At the same time, the aim is to create a versatile residential structure and a socially balanced residential area. The residents of A-Kruunu Oy will be encouraged to get involved in their building's activities by e.g. arranging an annual residents’ meeting convened by the property manager. In the meeting, topical matters will be discussed, a residents’ committee will be elected and a candidate for the Board of A-Kruunu Oy will be chosen. A residents’ committee improves interaction between residents and property management. The Act on Joint Management of Rental Buildings gives the residents’ committee a great chance to have on impact on the housing. Each committee decides which tasks it will be responsible for. In addition, A-Kruunu Oy will organise chairmen's meetings where the chairmen of various residents’ committees can share experiences on the housing and discuss matters concerning all buildings with the representatives of A-Kruunu Oy.